The main ingredient for tabooleh is bulgur, a cooked, dried, and "cracked" wheat product that is a replacement or alternative for rice or other starches such as potatoes in many Middle Eastern cultures. Bulgur has one great advantage over other grains or starches , as it does not have to be cooked. It can be reconstituted by soaking in hot or even cold water. It can be used as a stuffing for vegetables, fruits, poultry, and even a breast of lamb. 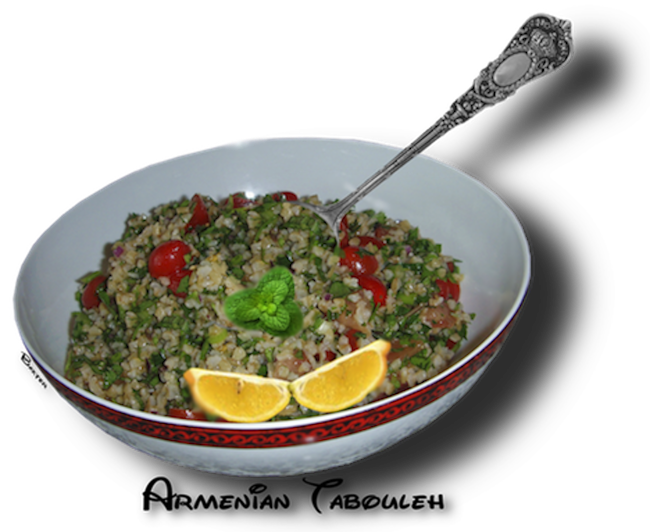 Bulgur is the main ingredient of the Middle Eastern wheat salad, "Tabouleh". Imagine the advantage a food like this would have for the Mongol Hordes of Genghis Khan, who marched across Asia and the Middle East and having a product that would feed his armies without the need for cooking or the worry of spoilage. It is not only healthful, but a tasty food that marries well with the spices of the Middle East. Bulgur comes in four varieties. It can be used as a whole kernel after being cooked, but not yet cracked. Used as a barley, or whole wheat product that is already cooked but just needs reconstituting. For other recipes, it comes "cracked" into a fine, medium or coarse mill. Each has it's own use. Tabooleh, as for this recipe, works best with the coarse milled product. Medium will also be acceptable. tabooleh with the romaine leaves. cayenne pepper out and try a ½ cup of these. Another tasty addition would be toasted pinion nuts. bulgur. For you vegetarians or vegans out there,  this is one healthful dish to put together.